Briefly push the control stalk downwards. This warning lamp comes on in the instrument panel and a message is displayed. 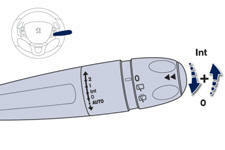 Briefly push the control stalk downwards again, or place the control stalk in another position (Int, 1 or 2). This warning lamp goes off in the instrument panel and a message is displayed. 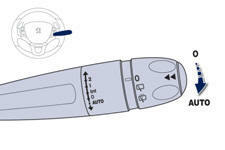 The automatic rain sensitive windscreen wipers must be reactivated by pushing the control stalk downwards, if the ignition has been off for more than one minute. If a fault occurs with the automatic rain sensitive wipers, the wipers will operate in intermittent mode. Have it checked by PEUGEOT dealer or a qualified workshop. Switch off the automatic rain sensitive wipers when using an automatic car wash. In winter, it is advisable to wait until the windscreen is completely clear of ice before activating the automatic rain sensitive wipers.